From posterior section of the mandibular nerve, the lingual nerve originates and between the ramus of the mandible and the medial pterygoid muscle it descends. 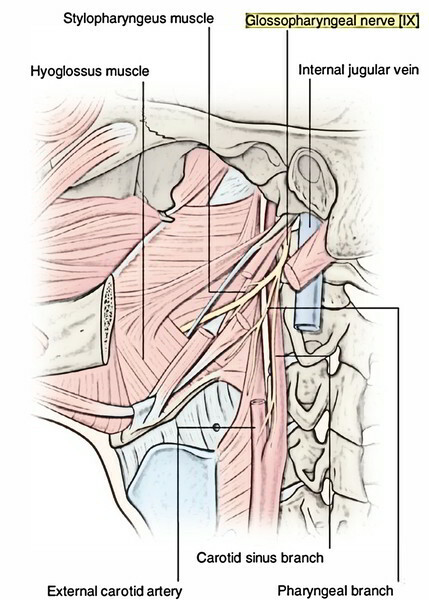 By passing inferior to the lower border of the superior constrictor of the pharynx and it inclines forwards subsequently, at its connection near the posterior end of the mylohyoid line, enters the mouth. Now between medial outermost layer of the mandible and the mucus membrane of the gingiva, it enters the submandibular region by passing just behind and inferior to the third molar tooth. In this position, it’s likely to be injured by the ungainly extraction of the adjacent tooth and is accessible to local anesthetics. 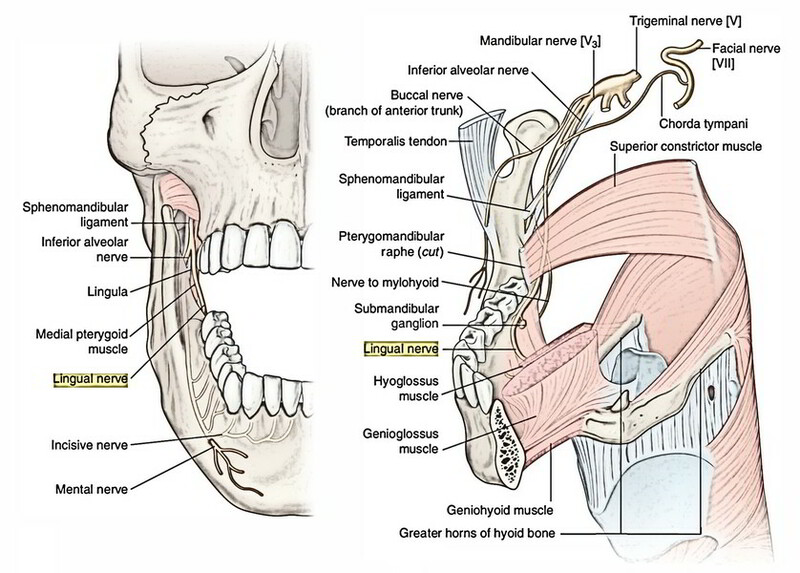 In its additional course, the lingual nerve is located near the side of the tongue, crosses the styloglossus and upper part of the hyoglossus and hooks below the submandibular duct. In the process, it crosses the submandibular duct superficially and after that turns up deep to the duct (the double crossing). The lingual nerve is itself corticoafferent to the anterior ⅔rd of the tongue and the inner (lingual) surface of the gums, but its content fibres belonging to the chorda tympani nerve carry taste sensations from the anterior ⅔rd of the tongue with the exception of from vallate papillae. Branches of communication (conveying twigs), viz. 2 or more to submandibular ganglion. 1 or 2 which descend along the anterior border of the hyoglossus to unite together with the hypoglossal nerve. A gingival branch to the inner outermost layer of the gingiva. Branches to the anterior ⅔rd of the tongue. The hypoglossal nerve runs forwards, crosses internal carotid artery, external carotid artery and loop of lingual before it enters the submandibular region by passing deep to the posterior belly of the digastric muscle. It continues its course forwards and upwards on the hyoglossus (below the lingual) and after that on the genioglossus to goes into the tongue. Here it supplies all the muscles of the tongue (intrinsic and extrinsic), with the exception of palatoglossus that is not actually a muscle of the tongue. 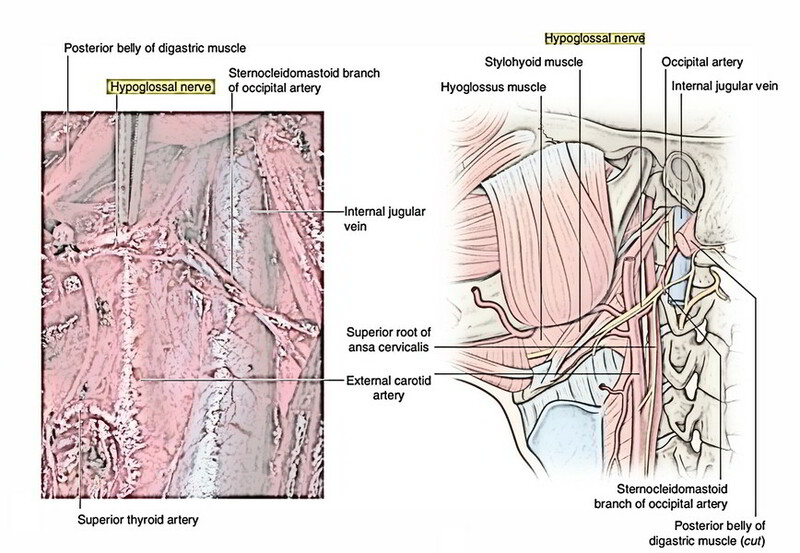 The glossopharyngeal nerve before going into the submandibular region descends on the medial side of the stylopharyngeus muscle, curves around its lower border to run forwards on its lateral side and supplies it. Afterward it runs parallel with the lower border of the styloglossus and enters deep to the stylohyoid ligament to evaporate underneath the posterior border of the hyoglossus to be able to get to the tongue. Its lingual branches express both general and flavor sensations from the posterior one-third of the tongue.